Quan You Hing’s father, Quan Foo 關富(marriage name Soong Woo 崇護) was born in San Francisco on 3 August 1889. By 1939 he had made four trips to China—in 1911, 1923, 1928, and 1932, and was living in Chicago, working at Hugh Sam Laundry. His wife, Moy Shee, was living in China with their four sons and one daughter. Their youngest son, Quan You Hing, was born in Lum Hing village, Hoy Ping, China on 13 October 1924. [His date of birth is also listed as 15 September 1924.] The family moved to Joong Wah Li, Hoy San district in 1930. 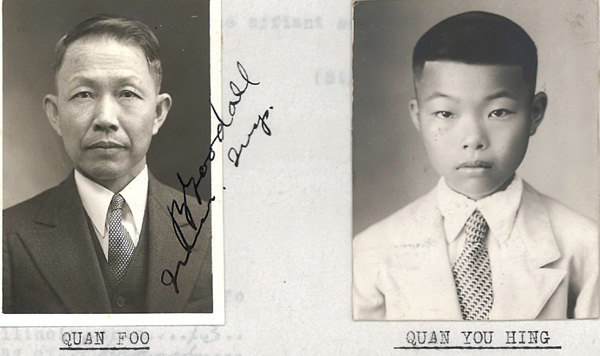 “Affidavit Photos of Quan Foo and Quan You Hing,” 1939, Chinese Exclusion Act case files, RG 85, National Archives-Seattle, Quan You Hing (Hugh) case file, Seattle Box 792, file 7030/12240. Quan Foo was bringing his son to the United States in 1939 because the Japanese were invading south China near their village and his son wanted to get away from the war. Ironically only four years later, Quan You Hing joined the U.S. Navy and died serving his adopted country. There is a note in front of his file, “Killed in action, December 1944, U.S. Navy, Hugh [Quan] You Hing.” There no mention in the file of why or when Quan You Hing joined the U. S. Navy. According to the muster roll of the U.S.S. Leutze You Hing Quan enlisted on 14 October 1943 and was received on board on 4 March 1944.1 His death is listed under Illinois in the U.S. Navy Casualties Books2: Quan You Hing, Electrician’s mate 3C, USNR. Father, Mr. Foo Quan, 2252 South Wentworth Ave., Chicago. 1. U. S. World War II Navy Muster Rolls, 1938-1949, Ancestry.com, p. 7, Image 24, National Archives at College Park; College Park, Maryland; Record Group: 24, Records of the Bureau of Naval Personnel, 1798 – 2007; Series ARC ID: 594996; Series MLR Number: A1 135. 2. Ancestry.com. U.S., Navy Casualties Books, 1776-1941 [database on-line]. Provo, UT, USA: Ancestry.com Operations, Inc., 2012.